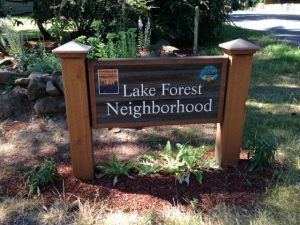 Today I want to introduce you to the neighborhood in Lake Oswego where I live, Lake Forest. 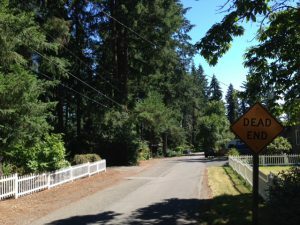 There are 25 specific neighborhoods in Lake Oswego, each with unique aspects and, for some, a neighborhood association. Lake Forest is bound on the North by Kruse Way, on the South by Boones Ferry Rd, on the West by I-5, and on the East by Carman Dr and East Waluga Park (approximately). For many years most of the neighborhood was in unincorporated Clackamas County. Some of it still is. I would say the single most distinctive characteristic are the large stands of towering Douglas Fir trees. Because some of it is unincorporated Clackamas County, many of the homes are still on septic systems. The lots on septic are not sub-dividable. Lake Oswego requires that if a septic system fails that is within 300 feet of the city sewer system, then the house has to connect to the sewer. This is gradually happening. Over time it is likely that all of this area will be brought into the city. It is a slow and gradual process that will take many years. In the mean time the large trees and large lots are a feature of the area. There is one park in the Lake Forest neighborhood, West Waluga Park. This park features a covered picnic area, a play ground for kids, a library book return drop box, and a fit spot workout station. The area is super convenient to I-5 and Hwy 217. It is also extremely walkable with Albertson’s and Zupans only about 1-2 miles from even the farthest reaches of the neighborhood. Then there are the many Starbucks. Not exaggerating, there are 6 Starbucks within a mile of my house. There are currently 15 houses for sale in the Lake Forest neighborhood. The least expensive is a 1258 square foot home that was built in 1970 and is listed for $475,000. It has 3 bedrooms, 2 full baths, and sits on .58 of an acre. The most expensive is a brand new house that is currently under construction and listed for $875,000. When finished it will have 2824 square feet with 3 bedrooms and 3 baths. I actually consider the Lake Forest neighborhood to be one of the more affordable parts of Lake Oswego. Personally, I love living in the area. I really like the convenience, but I also like the mix of housing. Older more modest homes are mixed in with new construction and more luxurious homes. Then you add in the flock of Peacocks that live on Bonaire and, well, it’s what I call home.